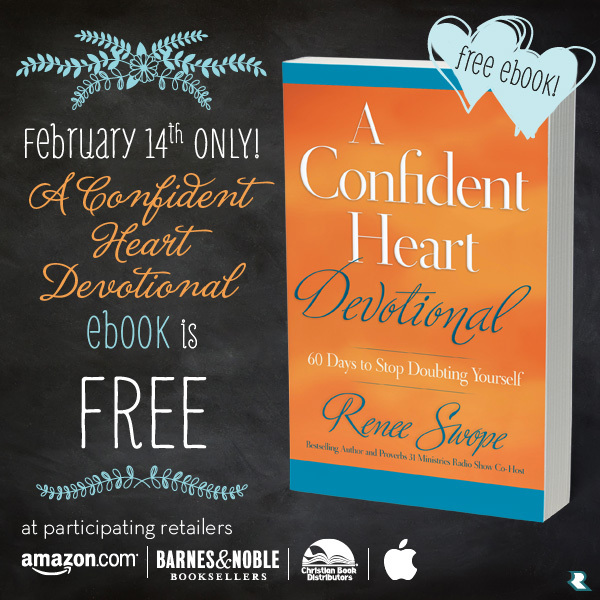 My friend, Renee Swope’s Confident Heart DEVOTIONAL eBOOK is #FREE TODAY only! So go and get yourself a copy and be blessed!!! Happy Valentine’s Day Courtney!! I hope you have a wonderful day with your family. Thank you for all of your work on this website and all your blogs. I love them!! You help me to walk with The King of Kings!!! Hi Courtney, thanks for this, and Happy Valentine’s Day! Will the EBook be available tomorrow or is it just for today? Do I have to pay anything to read after today? Is this book for us to keep? Hi again Courtney, sorry about that I was a bit confused as I’m not familiar with kindle! For some reason, this only arrived in my inbox of Gmail at 2:28 a.m. on Feb. 15, the day after Valentine’s Day , much too late to get the free copy. I’m really disappointed!!! Is there any chance the offer can be extended? I’m sure I’m not the only one. This wonderful email arrived at 3:30am on February 15th. I missed the free devotional. Any help to receive it now would be wonderful. The price on Amazon now says $7.99 🙁 Thanks. Have a beautiful weekend! I am so sorry I posted this at 6:30am on Friday onto the blog but Feedburner delayed really long to send it out to subscribers I just checked on Amazon and it is no longer free – I apologize. I did post it here and on facebook, twitter and pinterest. So sincerely sorry you missed it. That is probably one of the cons to getting posts by email. You are at the mercy of the server. The only social media I am on is email so the other ones like facebook, twitter and pinterest don’t work for me! Anyway have a good day! This also arrived at 3:30am on the 15th to me. I agree is there anyway to have a chance to still get it for free? My email arrived today, February 15th as well. I went to Amazon and the ebook is $7.99. Is there any way to get the free download since the email arrived the promotion? Thank you! Received this “Feb 14 only” email at 12:28 a.m. on the 15th! Why don’t you talk to the author and see if she’ll make it available to your faithful followers from your site. So sad…I just received the email his morning as well. I will add to my wish list. My Google Chrome (which I did not buy myself) was not on the devices for the Kindle download. Eh. I don’t think I’d be able to function normally if I didn’t doubt myself.